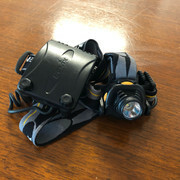 Fenix HP10 4xAA headlight. Like new. Sits in a box unused. Very bright and long runtime. IPX8 waterproof. Rugged and dependable. Sell $20 plus post, or pickup from Paddington or Newstead in QLD. Hi kanangra, it is still available - please pm me to arrange payment/pickup?